The Final Fantasy franchise has seen many games over the years, with fifteen in the main series, and a hefty amount more as spin-off games. These so called spin-off titles often allowed more people to get into the fun, with multiplayer based titles such as the Crystal Chronicles games, and of course the Dissidia series, which is pretty much the fighting game equivalent of the Final Fantasy world. Now with the latest installment of the Dissidia series in the works, we had the chance to try out the Beta, and while not that much was thrown in our laps, content wise, we enjoyed our short experience with this 3 vs 3 brawler. 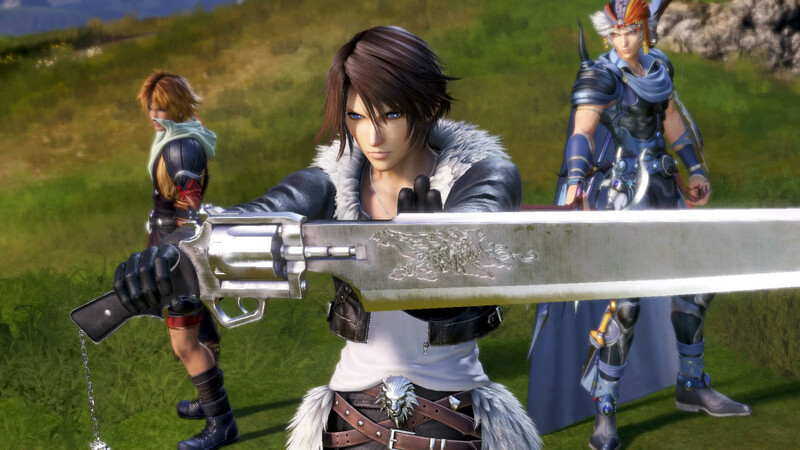 Sadly we are unsure if this Dissidia game comes with a storyline, or something that explains why well-known characters from every main Final Fantasy installment are picking up arms against one another. Then again, a game such as this thrives on good gameplay and mechanics, and a storyline is often rather negligible, as it’s all about pounding your competition into the ground. In terms of impressive battles, Dissidia NT didn’t shy away. 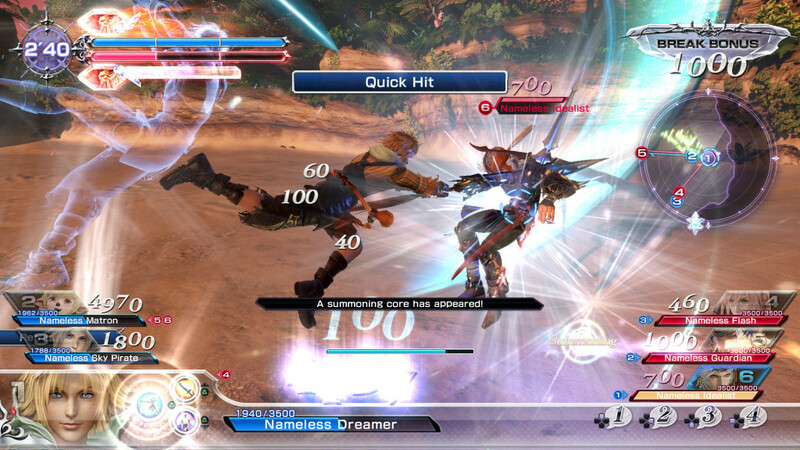 As mentioned in the introduction, this installment of the Dissidia series is a 3 vs 3 brawler, with fourteen character to choose from, which means that currently you’ll get to pick the protagonists from twelve titles, as two of the titles up until the fourteenth installment had been online titles in which you had to create your own character. To compensate, the game throws in two class based characters from said titles, to make sure there are more fighters to choose from. Sadly, as you might have already guessed from our explanation, this means that Noctis is awkwardly absent from this title, which is odd seeing Final Fantasy XV has been out for quite some time now. That being said, you’ll get to pick one of fourteen fighters, each staying rather true to their old familiar selves, albeit with different skill sets, which make sure that even fighters have a certain sense of diversity, pretty much doubling the amount of fighters to choose from. You’ll notice that each character’s skill sets will feel completely different, which makes them feel like a whole new character altogether. The actual combat is pretty straightforward. You can target one of the three opponents, in an arena in which you can roam around freely. Of course, you’ll also see who targets you, allowing to either play defensive or aggressive. You’ll be able to dish out damage with a set of different skills, which will make your opponents’ HP indicator flash, showing the amount of damage done. Nonetheless, the damage will not be properly dealt, until you hit him with a HP attack, which finalizes the damage you have done, making it permanent. If you don’t hit your opponent with a HP attack, the non-permanent damage dealt will start to decay, allowing him to build up his strength again. Of course you can keep popping HP attacks, but they will only deal small sums of permanent damage. It’s best to whittle an enemy down by dishing out non-permanent damage first, and then hit them with a HP attack to maximize the impact of your actions. Sometimes battles can get a bit chaotic, especially when the other team works together as a proper unit. If the other team can attack each of your team members as a unit, forcing character by character to go down, you’ll quickly find yourself drawing the short end of the stick. This makes it rather apparent that this game is truly a title that is based on the effort of a team, rather than the skills of a lone player. Visually the game is very pleasing, even though the arenas are often a bit void of any clutter or other items that would make them feel alive. We reckon this has been done for practical reasons, to prevent players constantly running into things. The characters all pay a proper homage to the respective source material of the original Final Fantasy games, with many of the old pixilated characters receiving a well deserved visual upgrade or new interpretation. Overall the game looks quite spiffy and worthy of being a Final Fantasy title. 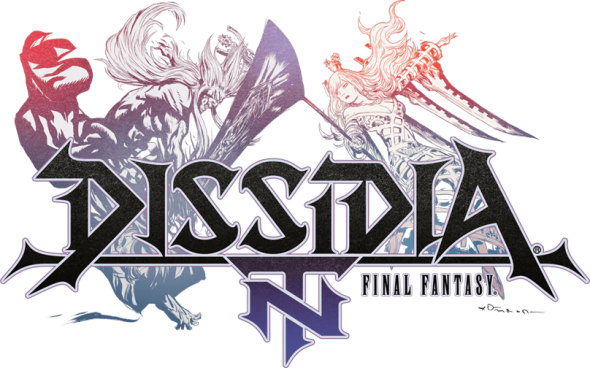 While we didn’t have that much content to wade through, we believe we have seen the base of Dissidia Final Fantasy NT, which looks promising, albeit a bit basic. The latter is not really a bad thing as this makes the game very accessible for those who don’t have a lot of experience when it comes to fighting games, but still love the many different worlds that have gone by us in the Final Fantasy franchise. 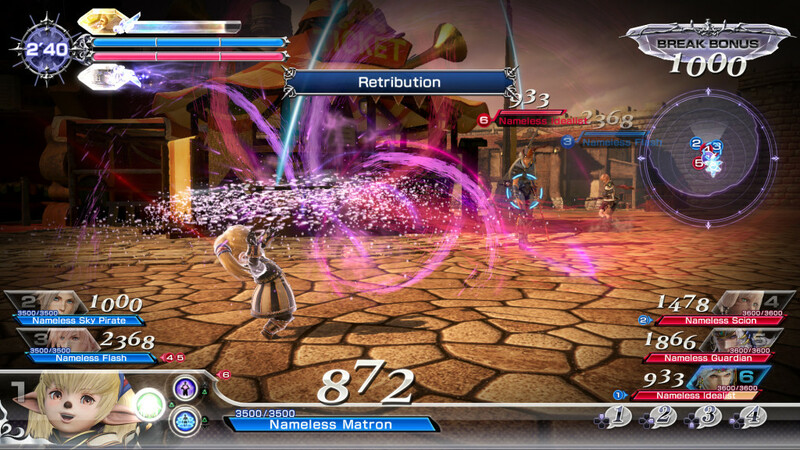 If you’re looking for a simplistic brawler, with enough depth to allow progress in terms of skills, NT is a decent addition to the Dissidia lineup of games.